The Federal Communications Commission has dismissed beIN Sports’ third complaint against Comcast/Xfinity. The rejection was made with prejudice, which means beIN can’t re-file it. Comcast dropped beIN back in July 2018. To make things worse, DirecTV/DirecTV Now dropped beIN Sports a month later. Verizon Fios also dropped beIN in August 2018, significantly reducing its distribution from almost 22 million homes to now just 15.4 million. While we are disappointed with the finding of the Commission concerning the dismissal of our refusal to deal claim, we are reviewing our procedural options. Our separate complaint about Comcast’s discrimination against us remains pending. We look forward to completing briefing on this claim and to the FCC’s eventual decision on the merits. It remains our strong preference that Comcast listen to customers and engage in meaningful discussions concerning the restoration of beIN SPORTS programming to its cable platform. It leaves beIN Sports in the dark without the major pay TV providers and with this latest FCC ruling, it cements the network’s position standing between a rock and a hard place in trying to gain carriage. In March, beIN Sports filed its first complaint, saying Comcast violated a carriage agreement and discriminated against the channel. The FCC said beIN failed to prove its argument, but that it could file again, which it did. But with two major setbacks, it’s unlikely that the FCC would rule in beIN’s favor again. With beIN Sports behind the eight ball, it’s also unlikely that it could get picked up by DirecTV and Verizon anew. So as beIN Sports struggles, it also doesn’t have leverage like an FCC ruling to stand behind it. It will be difficult for the network to continue. beIN had struggled even with Comcast, DirecTV, and Verizon on board, but the road ahead will be even more difficult. It would not be surprising to see beIN Sports go dark in the near future. 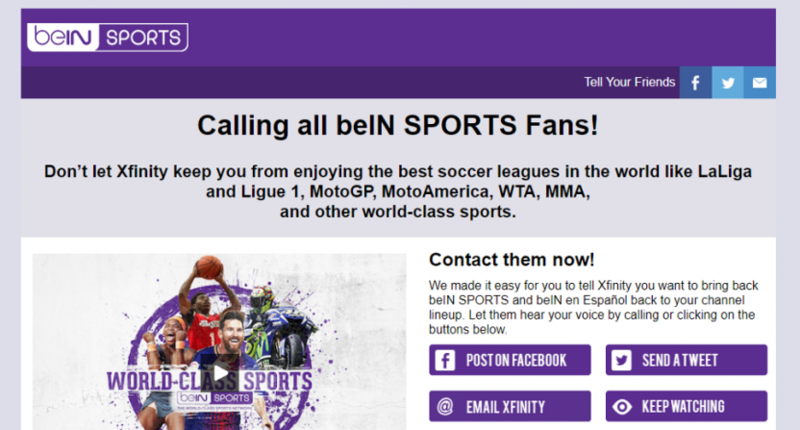 While its owners do have deep pockets and have been successful in other countries, beIN has failed to gain rights to any of the major sports in the U.S. It has rights to La Liga, Ligue 1, a few international soccer competitions, and Conference USA basketball and football. Due to beIN’s distribution problems, the WTA tennis tour left the network last year and signed a long-term deal with Tennis Channel. So at this point, beIN is at a crossroads with an extremely difficult uphill climb.